Good luck to u and I too have heard from Kristy Miller.. just nervous on making contact though.. I too am looking at knight and to me Knight has what i am looking for; hope they can offer what u are looking for . Just finished the biggest week so far, but felt like I was slacking. Does that work for u?? waiting till midnight to drive again?? whats its like driving in night time instead of driving in the day time ?? Welcome to the tt. So glad u made it. and yes this place is full of good and wise ppls who truly knows what their talking about it!! Listen to them and read their stories, you will learn what they know and become even better driver and person. Once again welcome to the Place where truth respect and learning are King/ queen of this site.. Thank u I hope to get more people to read this, I mean truly read this and get the same feeling I and James W. got. Its very motiving and inspiration for anyone entering this career.. Once again I am thankful that I wrote this and am looking forward for many comments from this..
After losing my job back in the summer of 2011, I begin to evaluate my situation and saw that I had a new chance to begin anew and pursuit something that will bring me pride and joy. Something that I wasn't feeling from my old job/ career. Then like a flock of geese coming in from the west, It dawn on me that I should become a truck driver!!!! I do love to travel and I do enjoy a challenge ( its been a long long time since my abilities has been challenge) seeing new and exciting things that people only dream about or see on tv while at the same time being paid to do it. Now I know its very challenging to any newbie entering this field, but in my opinion its builds character, it make you see your true self and to overcome your darkest fears. In the end it well worth. To me being a trucker can be rewarding if one work very hard, listen to what his f.m. says and accept any loads that given ( unless you work for a company that offer no dispatching ) even then as a rookie accept any loads and do your job with a attitude of I can and I will do this. On time and safety!! this industry can be cold can be mean spirited and have a lot of negative ppls in it, but the best advice is to ignore it and find positive people with a mindset of going higher and making this career work and being the best. 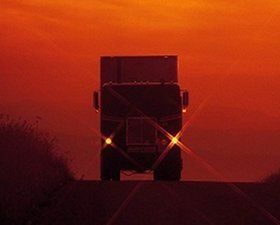 Being a trucker can be a beautiful rewarding career that's well worth it in the end. Its more than a dream, its more than another job , its more than just getting your cdl-a permit and trying to get to a private school or a company training to get the basic experiences that's needed. Its a calling to something solid, and living and breathing just like you. Like a lighthouse urging you to enter this place, to experience a better way of making a living for yourself and for your future. Why do I want to become a trucker?? Simply put; to be something greater than myself, to feel pride in what I do and that at the end of the day I know beyond a shadow of doubt, I gave it my all each and everyday. To be respectful to the shippers and to the customers, to be accountably for my action with each and every load. To give this new career a lot of my energy and my focus. To always keep learning and to not give up or give in . To be a better communicator, a better listener and being a better person as young man to strive to being the best in my future career and in my life. This is why I want to become a truck driver in my own words and from my own opinion on this matter. MG, Glad you made it thru that day. And you handle that day with honor and with maturity of a queen! Even though your trainer was a dirtbag and seem to be a not a great trainer! Whoever told him he was was lying thru their teeth! I mean come on, texting ur gf on the job??! talking to ppls while in a training seesion with a new employee??! Whats has the this world come to??! Wow SMH on this nonsense and jive!!! SRT is less out of pocket for school and pays better overall and has more varieties of freight than stevens it seems. They also allow pets. stevens pays less, school cost more and from what I am told they typically have fewer miles. They also have apu and built I'm inverter where srt does not. Hey there Mr. M. 1st off welcome to the TT. Glad you found a place where the truth is king and advice is like true like an arrow: straight and true. 2nd off: Calm down man!!!! Breath!!! 3rd: Do u have your CDL-permit?? 4th: You need to grab a notepad and write down what u want to do in trucking and stop worrying about companies who has what and who doesn't . You need to look at where u want to spend your 1st year. 5th: in reference to 3rd; if u don't have your cdl permit ; study the HRT(High Road Training program) to get you up to snuff and u can be ahead of others who didn't study . We have a driver that is starting with this company or already has. It's a flat bed company that drives blue kw's mostly. Is it me or does someone have a small problem with collecting stuff. Now I know sometimes you need that little extra to secure a load and trying to improvise on site can be a pain but from what I have seen there are places other than here to store excess wood and the like. Pretty sure a Dot officer might have a few words to say about this. I guess the phrase "Catwalk must be clean and free of debris" does not apply to some people. Maybe he likes walking on this stuff to get up on his trailer? Who knows. What was he thinking??! He wasn't thinking at all nor was he being smart!! 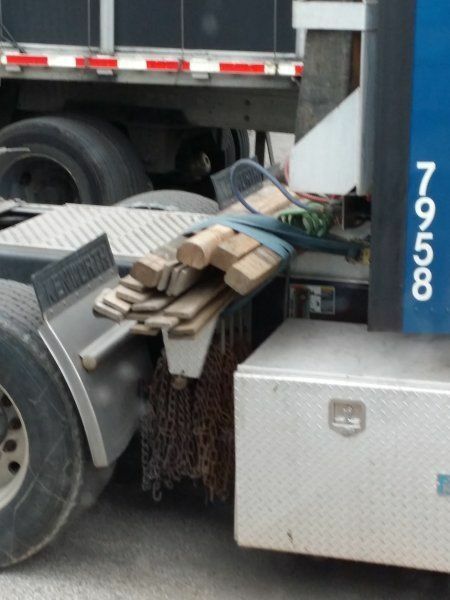 wow it just boggle the mind that ppls are truly lazy and plain stupid to even store stuff like that ..
What steps do i need to take to get my trucking career off and running? @ brett: I truly thank you from the bottom of my heart that u guys pointed me in the right way / yes ima gonna study and work on me getting my nc driver's license and to keep it clean and then go for my nc cdl permit and then give my choice trucking company a call.. Does that cover cdl permit too ?? in the meantime what about studying for my cdl shall I stop that too as well ?? Truth is I don't have my driver license which I am working on, and what do I have to do to get myself out of this runt im stuck in? Shall I stop studying and stop looking for a trucking companies? And focus on getting my driver license from N.Carolina ?? What shall I do and I am sorry , I do want to become a trucker but I must know if I am doing this right or wrong. If I am doing this wrong please explain this to me and set me straight and guide me to the right road. Is there any current or former knight drivers that can tell me their experiences with knight.. Welcome to TT sandra. hope u get all ur questions answers and your dreams fulfilled. please tell us more about yourself if u please. make yourself aware of what T.T. has to offer u.
Florida CDL permit, endorsements etc. my reason : i have chosen them because overall heard nothin but good things about them. To me, Knight Transportation fits the billet / shine above the rest of my choices..... from their training program to the many options of driving choices ...wow!!! The recruiter called back, she was happy I passed the tests. No problem without the medical card, they handle that part when I get to school. @lilrichie, I would talk to whoever you're planning to go with to get more info on their process, but you can definitely take the written tests in NC without a medical card.